20 pamphlets and one letter between 14.5 x 22cm and 11.5 x 14cm each. Letterpress and Litho on Laid and white stock, with handwritten letter fron Anderson. Collection of ephemera covering the year Anderson launched ‘Sequence’ with Peter Eriksson, Karel Reisz and Gavin Lambert. During this time Anderson served as a committee member – first for publications, and then as vice president, and contributed greatly to programming, criticism and debates organised by the society. Penelope Houston, editor of ‘Sequence’ also served with Anderson during this time. The programmes are retrospectively quite adventurous, a mixture of what are now Hollywood classics and Avant Garde European cinema. 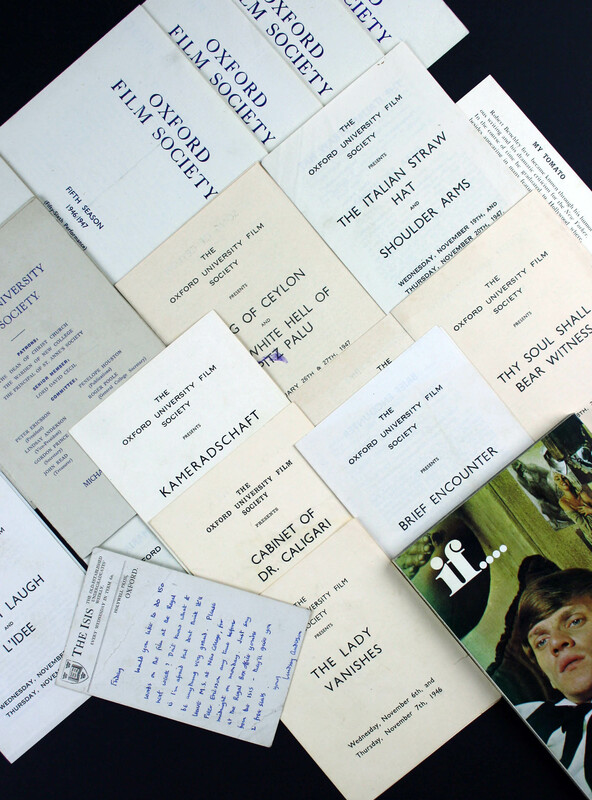 Anderson wrote the critical texts for many of the programmes, and later acknowledged this time as a formative one- and the seeds of the ‘Free Cinema’ movement of the early fifties, foreshadowing much of the social realist British cinema that was to emerge in the following decade. He went on to have a fruitful career as a director with films sych as If…, O Lucky Man, This Sporting Life and Look back in Anger, as well as documentary work such as ‘O Dreamland’ and theatre works with the Royal Court.